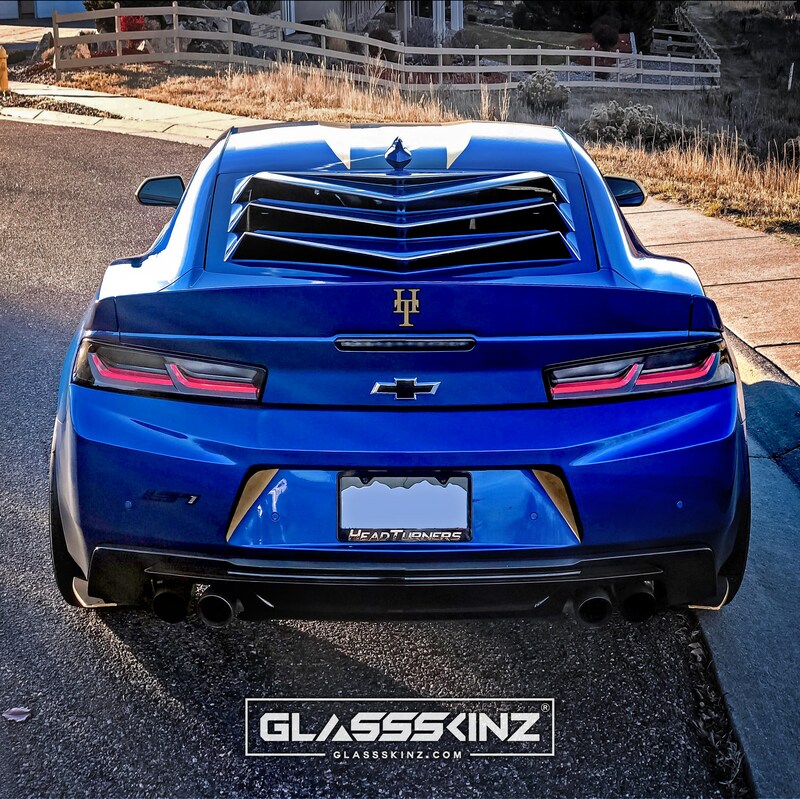 GlassSkinz� 21ST century rear window valence / louver for your 2016-19 6th Gen Camaro RS, SS, SS 1LE, ZL1, ZL1 1LE. �Put the Future Behind You!� U.S. Patent No. D825,419S. Made in USA. Limited lifetime warranty. A new day is dawning in automotive styling led by Dare 2B Different!� Motorwerks. We all know the only constant in this world is change. Both evolutionary and revolutionary change bring about new things that often amaze us. 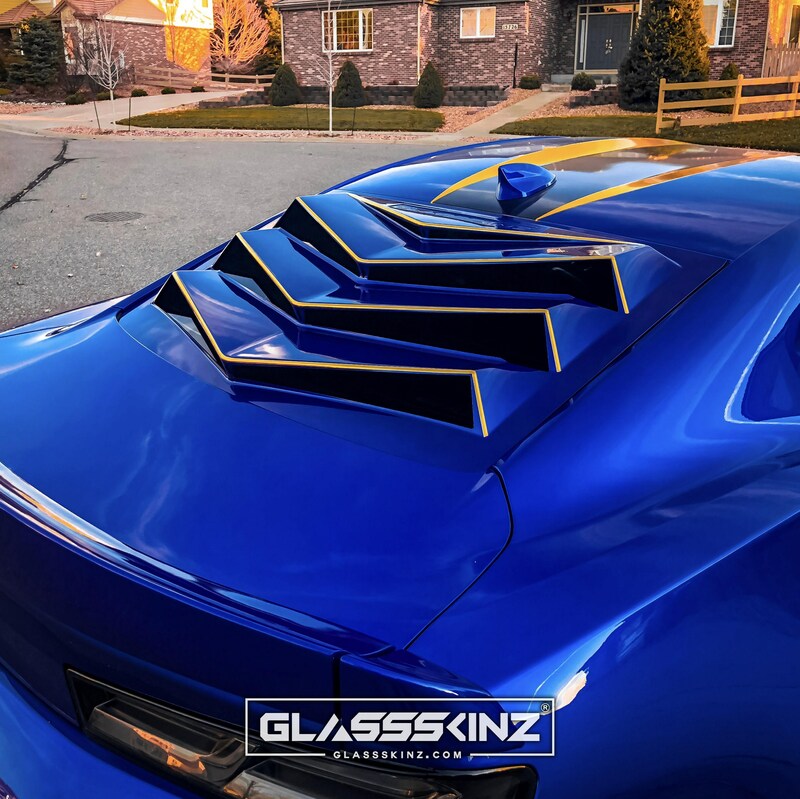 GLASSSKINZ� is Dare 2B Different!� Motorwerks latest design introduction. We have thrived upon these principals since 2004 developing unique niche market products with OEM or better quality. 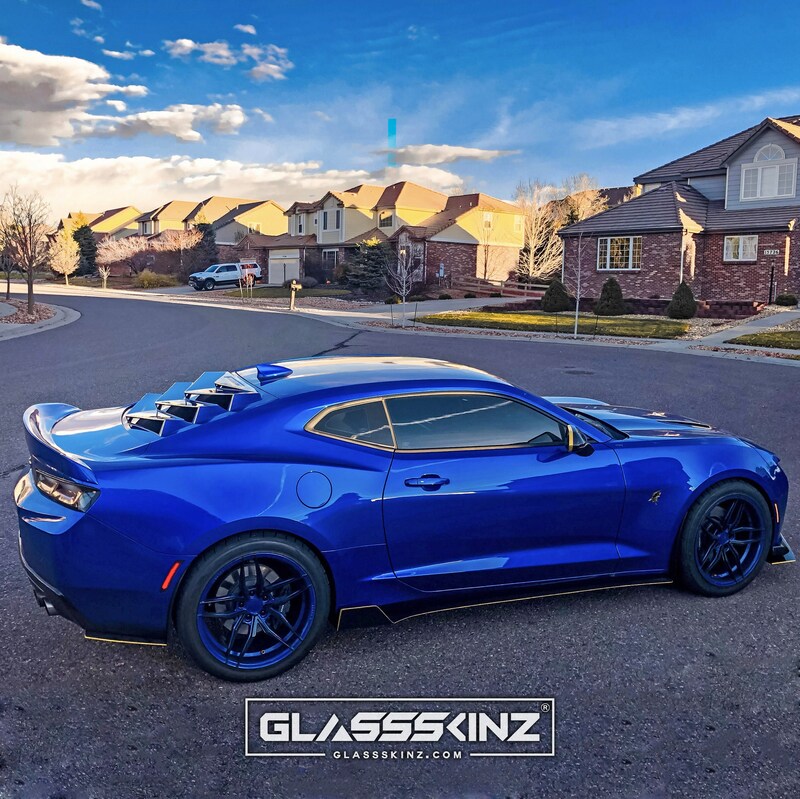 As the automobile market marches into the 21st century, glass is becoming a more and expanding part of styling as new technology allows us to bend it in more extreme ways. The new larger glass panels present a glass scape that remains undeveloped. 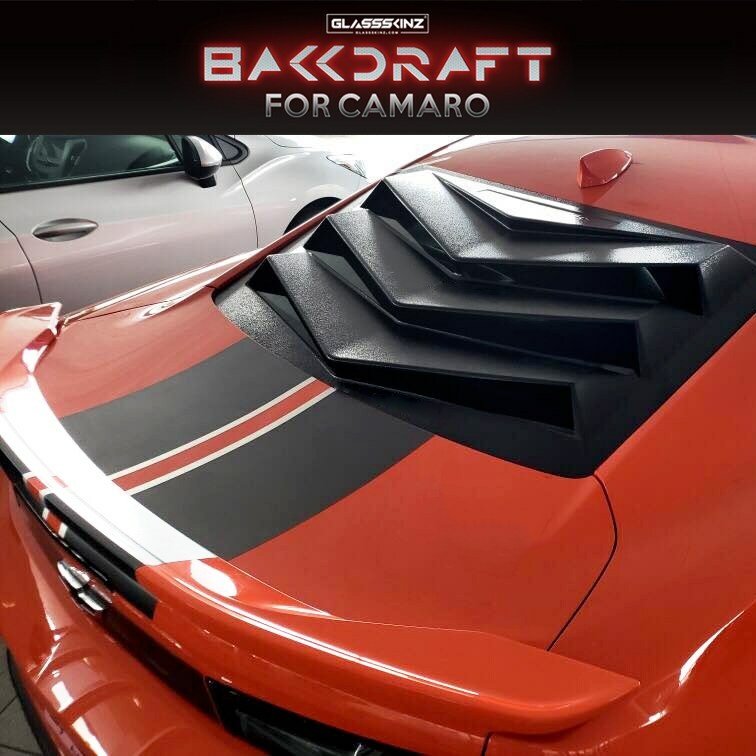 The new Camaros are a great example of this and have been a great inspiration to us in their modern design. In our eyes, the large rear glass panel is just begging for some styling. This led to the creation of GLASSSKINZ� a fluid design exercise turned into reality. So unique, the U.S. patent office awarded us U.S. Patent No. D825,419S! 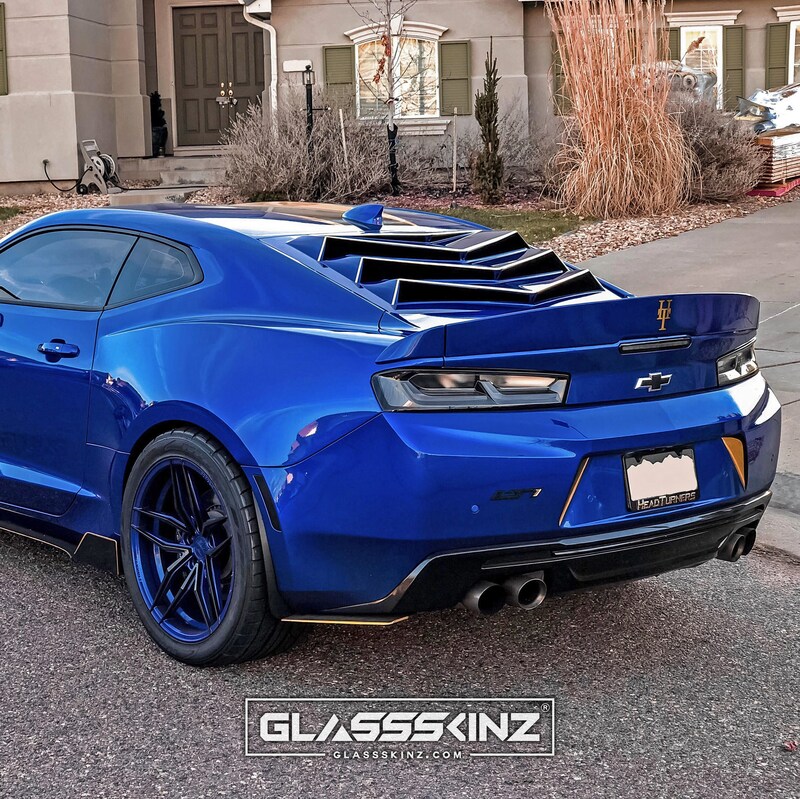 Introducing the GLASSSKINZ� BAKKDRAFT 6TH GEN CAMARO SERIES! No. We are the only rear window valence to have passed the NHTSA rear view visibility testing. From the outside it gives the illusion that it cannot be seen through, however, from inside the cabin it is designed to essentially vanish. Please click on documents to see the full test with numerous photos. Also, check out reviews of current owners! in our testimonials and reviews sections. 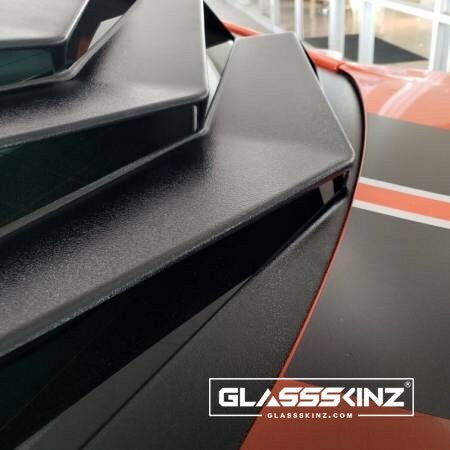 The Glassskinz adhere to your rear glass with genuine 3M brand OEM grade VHB tape. Rated -20 degrees to 200 degrees Fahrenheit. The tape is pre-installed for quick installation. A large adhesion promoter pen is included for installation. Glassskinz� are designed to primarily cover areas of the glass that are already blacked out and not looked through. The two side ports are exposed glass. Cleaning under the louvers is done with a glass cleaning arm or microfiber cloth and 20/20 glass cleaner. There is enough room for most people to fit their hand in under the louver. The part carries an industry-leading limited lifetime warranty from date of purchase for manufacturers defect. The paint carries a one year warranty with an option to extend it to five years at an additional cost. Use drop down. See Extra Details for full Warranty Disclosure.